Please check this page regularly for updated seminar information. Since 1990, Grandmaster Wang has been taking his students to top level competitions in Henan province and the Chinese National Championships. His expertise as a teacher is demonstrated by the fact that his students have won more than 30 gold medals at these competitions. I first encountered Grandmaster Wang Haijun at a demo in 2005. At the time, I was greatly inspired by his mastery of the art and decided to take up Taijiquan classes. Since, I attended numerous of his workshops organised by Shifu Niall O Floinn and experienced firsthand the quality of his teaching. Grandmaster's energy, knowledge and passion for transmission are very palpable. Each encounter with him has been an opportunity to gain new insights into the practice and discover notions that would be difficult to grasp without such expert instructions. I felt privileged to learn directly from him and would encourage anyone to do the same if they get a chance. I have been practicing Chen style Tai Chi with Naill O’Floinn Tai Chi academy since 2013. Additionally I attend workshops with Grandmaster Wang Hai Jun on a regular basis. Niall’s dedication and Grandmaster Wang’s enthusiasm keep encouraging my desire for self improvement. I get a lot of enjoyment and relaxation from practicing Tai Chi. What I find the most important are the benefits for my health. My regular training has helped me to improve my posture and ease my lower back pain. I’m mentally more relaxed and focused in my everyday life and work. Practice has very much become a lifestyle for me now. I am very grateful to being able to train with Grandmaster Wang as i know there are very few teachers of this quality in the world. 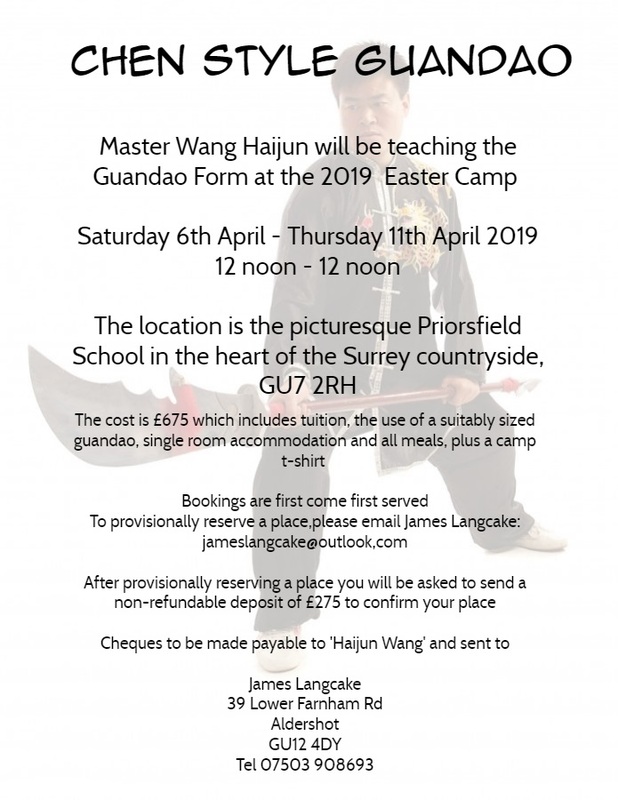 Here in the West we are very lucky to have Grandmaster Wang Haijun. His proven skill at Chen Style Tai Chi is equalled only by his skill at teaching. This fusion of skill and teaching puts him in a league of his own. A man of great integrity, he has worked hard to embrace the needs of his Western students while staying true to tradition. He is a patient, meticulous, creative and accessible teacher. He has a very low stance – with one foot always firmly planted in Chen Village.